Abel Luna leads protestors in a chant outside the Chittenden Regional Correctional Facility where one of the dairy workers is being held. Activists gathered outside the Chittenden Regional Correctional Facility Monday morning to protest the arrest of two Vermont dairy farmworkers originally from Mexico. U.S. Border Patrol stopped the two farmworkers when they were driving home to their Franklin County farm. The couple was returning from a Migrant Justice march on Ben & Jerry's, where they were demanding better labor conditions for Vermont dairy workers. U.S. Border Patrol spokesperson Brad Brant says the two have been handed over to Immigration and Customs Enforcement (ICE), specifically to the Enforcement and Removal Operations department that handles deportations. Brant says Yesenia Hernández, 19, and her partner, Esau Peche, 26, were stopped in a routine patrol check on a road near East Franklin, Vermont, only a few miles from the U.S.-Canada border. The couple was about 10 minutes away from their home at the farm where they work, according to Migrant Justice. Brant says the officer pulled over the car to check the occupants' immigration status. He says the officer had reasonable suspicion to stop the car because of its location near the border, and "the behavior, the way the car was being driven." "I can't tell you the specifics on how the reasonable suspicion of illegal alienage was developed, but they were on a road that approaches the international border in the area of East Franklin," says Brant. Both Hernandez and Peche are actively involved with Migrant Justice, a group that advocates for undocumented farm workers in the state. Peche has been in Vermont about seven years, and Hernandez for about two years. Brant says U.S. Border Patrol was unaware that the individuals had previously protested at an activist march earlier on Saturday. More than 100 activists and supporters marched 13 miles from the state capital to the ice cream factory to demand better wages and working conditions for dairy workers. About 25 protesters showed up at the detention facility in South Burlington where Yesenia Hernández is being held. 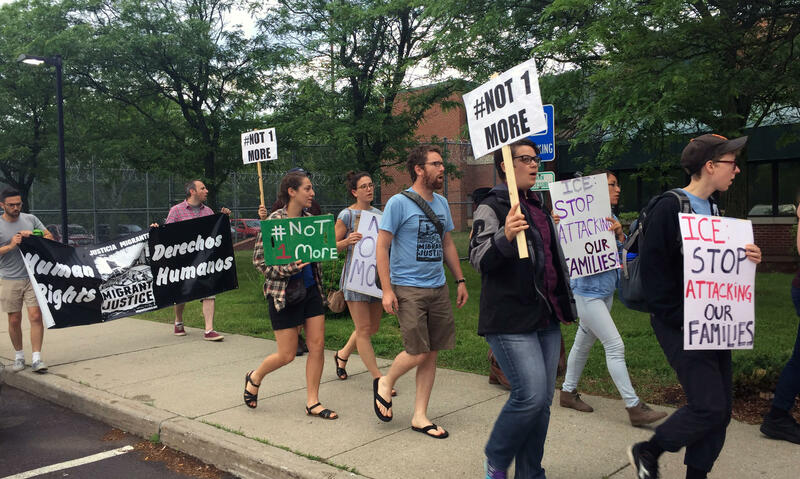 Many of the same protestors showed up Monday morning at a rally outside the Chittenden Regional Correctional Facility where Yesenia Hernández is being held. "We've got to push them to, ICE, to make sure that they are released as soon as possible, so they can get back to their communities and to continue the work that they do, fighting for our rights," says Abel Luna, an organizer with Migrant Justice. About 25 protestors chanted in Spanish and English, hoping that Hernández might hear them through the building walls. The protestors are heading to the ICE office in St. Albans, where Esau Peche was taken after the traffic stop, to continue protesting at noon. The Saturday arrests come after several other high-profile arrests of Migrant Justice leaders, including Enrique Balcazar and Zully Palacios. The couple was arrested in March and released on bail a few weeks later. Update July 5, 1:02 p.m.: Yesenia Hernández and Esau Peche were both released from detention on June 30, after a bail hearing in federal immigration court in Boston. The judge opted to reduce the bail to $6,000 per individual after hearing their cases. Both Hernández and Peche are back in Vermont, pending their immigration hearings, which have yet to be scheduled. Migrant Justice and other advocates for Vermont dairy workers plan to march in protest on Saturday in an effort to pressure Ben & Jerry's to come to an agreement on wage negotiations. What's It Like To Be A Migrant Worker In Vermont? If you drink Vermont milk, or eat Vermont apples or vegetables, it's likely that you have foreign workers to thank. But do you know any?